Just sorting through recipe cards, I came across another card for Nut Rolls. The various cards all appear to be in the same handwriting, so perhaps the lady liked them, lost the recipe/wrote it out again, found it, on and on. 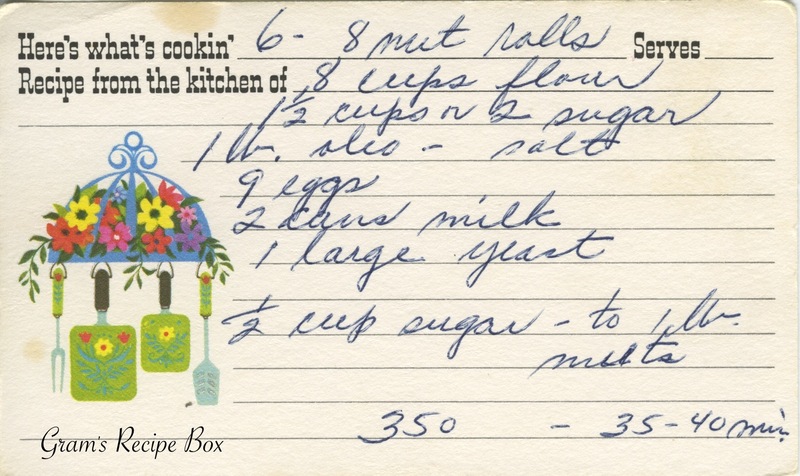 When these recipes call for “cans of milk” are we referring to evaporated milk? I believe it is evaporated milk. It was also called pet milk for some reason. Thank you so much for the quick response. Yep, that’s what my sweet Grandma called it..Pet milk. She used it in her tea. Pet milk is the brand name for an evaporated milk. I love how these ladies didn’t need detailed directions. Just highlights.